An illustration of the "family" of launch vehicles Stratolaunch had planned to offer. The company is ending work on its own launch systems, leaving it with the existing Pegasus XL (left). 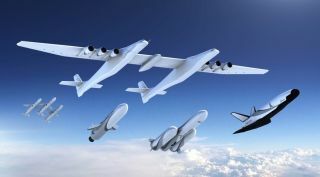 WASHINGTON — Stratolaunch, the company founded by the late billionaire Paul Allen, said Jan. 18 that it is ending work on a launch vehicle that would be flown on the company's giant aircraft. In a statement to SpaceNews, a company spokesman said that the company was ending work on its own family of launch vehicles and would instead use its aircraft for launching small Pegasus XL rockets from Northrop Grumman. News of the change in plans was first reported by GeekWire. Stratolaunch made no mention of layoffs in its statement, but sources familiar with the company said they expected up to several dozen people to lose their jobs with the termination of the company's vehicle development effort. Stratolaunch is best known for its development of a giant aircraft that will be the largest in the world by wingspan. The twin-fuselage plane, with six jet engines, has carried out a series of taxi tests at the Mojave Air and Space Port in California, most recently one Jan. 9 where it reached a speed of nearly 220 kilometers per hour. In that test the plane's nose gear briefly left the ground in a "rotation authority maneuver" that suggested the plane was nearly ready for its first flight. "Surpassed all expectations and met every test objective," Jean Floyd, president and chief executive of Stratolaunch, said of that taxi test in a Jan. 11 tweet. The company's plans for a launch system that would be ferried by the plane have gone through several changes. When Allen announced Stratolaunch in late 2011, the original design called for the plane to use a modified version of SpaceX's Falcon 9 rocket as the launch system. The companies parted ways within a year, though, and Orbital Sciences (later Orbital ATK and now Northrop Grumman) replaced it with a vehicle called Thunderbolt that featured solid-propellant lower stages and an upper stage powered by an Aerojet Rocketdyne RL10 engine. Stratolaunch, though, decided a few years later to discontinue that effort, seeing greater demand in small satellites that require smaller vehicles. In October 2016, Stratolaunch announced a partnership with Orbital ATK where it would use the existing Pegasus XL rocket on the plane. One concept shown by the company involved flying three Pegasus rockets at a time. The company, though, had not lost interest in larger launch vehicles. The company hired a former NASA and SpaceX engineer as its vice president of propulsion in mid-2017, and in September 2017 signed a Space Act Agreement with NASA’s Stennis Space Center to use propulsion test facilities there. Stratolaunch didn't formally announce its launch vehicle development efforts until August 2018, when it said it was developing what it called the Medium Launch Vehicle, capable of placing up to 3,400 kilograms into low Earth orbit with a 2022 first launch. The company also said it had concepts for a larger vehicle, able to place 6,000 kilograms into LEO, as well as a crewed reusable spaceplane. Those vehicles would be powered by an engine the company was developing called PGA, which took its name from the initials of founder Paul G. Allen. The engine, using liquid oxygen and liquid hydrogen propellants, was intended to produce up to 200,000 pounds-force of thrust. In November, Stratolaunch said it successfully test-fired the preburner, the smaller of two combustion chambers in the staged combustion engine. However, the death of Allen in October from complications of non-Hodgkin's lymphoma raised questions about the future of Stratolaunch, which was effectively entirely funded by him. Allen's holding company, Vulcan Inc., said at the time that Allen drew up plans prior to his death for continuing his various ventures, but did not disclose them. The announcement leaves Stratolaunch reliant on the Pegasus XL, a vehicle with a long record but little demand given its high prices. The company had argued that the ability to carry three Pegasus vehicles on a single flight would allow it to deploy a constellation of satellites into different orbital planes, since the aircraft could change its trajectory as needed. That flexibility may not be sufficient, though, given the rise of a new generation of commercially developed small launch vehicles with much lower prices. In its statement, Stratolaunch reiterated that it would continue tests of its aircraft. "We are immensely proud of what we have accomplished and look forward to first flight in 2019," the company spokesman said. This story was provided by SpaceNews, dedicated to covering all aspects of the space industry.